Generation of smooth curve contours for a smooth cut ! Different text shapes, variable font sizes, easy to create stencil letters or connected letters, input millimetre or inch, merges contours, different frames, easy to use, a lot of graphic functions to modify the created geometries. The software contains functions to check the generated contours. In addition, a function is available to insert your own DXF-graphics. 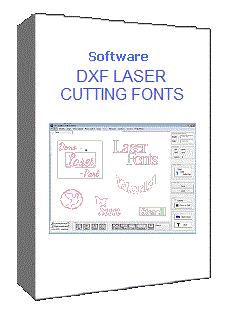 To create DXF-Graphics the program uses TrueType fonts (TTF fonts), which are installed on your computer. These TTF fonts are freely available in thousands on the internet. By installing new fonts you can use a vast number of fonts ( clipart fonts, script fonts, etc.) with this software. Ideal for laser -, plasma - and waterjet cutting ! New in version 5.1: Improved text scaling. Additional option for lines of text. Additional delivery of a full version as a download link for your computer. The buyer get the software on a USB flash drive. In connection with this USB flash drive you can use the software on any single-user computer - the USB flash drive must be connected with the PC during working. Additionally you get a download link to download a full version (immediately executable) which is generated for your computer. On business days within 24-hours.